COR DOS OLHOS - COMO DEVE SER OS OLHOS DOS LABS? Caros Amigos, já estou virando quase um "CAÇADOR DE MITOS"... e seguindo com está sina, vamos DESTRUIR mais um mito... essa historia de olho verde nos labs chocolates!!! Antes me desculpem, mas vou fazer um DESABAFO..., a internet é ótima para muita coisa... mas também serve para colocar muita minhoca na cabeça de muita gente, sempre tem um metido a esperto ou outro escrevendo algo que ele pensa, e muitas pessoas infelizmente acreditam no que lêem sem fazer nenhum tipo de pesquisa, e sem embasamento cientifico algum. "OLHOS: tamanho médio, de cor marrom ou avelã, com expressão inteligente e bom temperamento." "EYES : Medium size, expressing intelligence and good temper; brown or hazel." "Eyes--Kind, friendly eyes imparting good temperament, intelligence and alertness are a hallmark of the breed. They should be of medium size, set well apart, and neither protruding nor deep set. Eye color should be brown in black and yellow Labradors, and brown or hazel in chocolates. Black, or yellow eyes give a harsh expression and are undesirable. Small eyes, set close together or round prominent eyes are not typical of the breed. Eye rims are black in black and yellow Labradors; and brown in chocolates. Eye rims without pigmentation is a disqualification. " Importante: a Cor dita como avelã em Português nos padrões da FCI, bem como no padrão do AKC, ou seja em ambos.... traduzindo seria HAZEL, e é citada ASSIM desde modo. Agora que conhecemos o Padrão da raça, podemos fazer algumas considerações, a primeira delas e a respeito da COR - HAZEL, portanto temos que entender também o que é a cor HAZEL, vamos ver? The perception of color depends upon various factors. 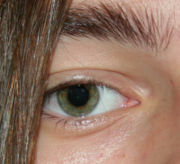 These are the same eyes; however, depending on the light and surrounding hues, the eye color can appear quite different. Iris color can provide a large amount of information about an individual, and a classification of various colors may be useful in documenting pathological changes or determining how a person may respond to various ocular pharmaceuticals. Various classification systems have ranged from a basic "light" or "dark" description to detailed gradings employing photographic standards for comparison. Others have attempted to set objective standards of color comparison. As the perception of color is dependent upon the conditions in which color is viewed (e.g. the amount and type of illumination, as well as the hue of the surrounding environment), so is the perception of eye color. The color was dropped from the image outside of the iris." Brown human iris. The color was dropped from the image outside of the iris. 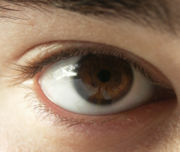 In humans, brown eyes contain large amounts of melanin (primarily eumelanin) within the iris stroma which serves to absorb light, particularly at the shorter wavelengths. Very dark brown irises may appear to be black. People with light brown irises are sometimes said to have whiskey eyes. Brown is very predominant and, in many populations, it is the only iris color present. Those with both European and non-European ancestry generally have dark eyes and more variability in eye color within there families. Inhabitants of Africa, Asia, and the Americas have brown eyes. Brown eyes are equally found in Europe, Oceania, and North America, though within some European populations they are not predominant to the same extent. fact}} Brown is considered to be the most dominant eye color in any gene. A green-brown human iris displaying a dark brown center and a green outer area. This type of iris, although rare, is often also called hazel. Hazel eyes are due to a combination of a Rayleigh scattering and a moderate amount of melanin in the iris' anterior border layer. A number of studies using three-point scales have assigned "hazel" to be the medium-color between brown and blue. This can sometimes produce a multicolored iris, i.e., an eye that is brown near the pupil and green on the outside. There is some difficulty in defining the eye color "hazel" as it is sometimes considered to be synonymous with brown and other times with green. They have been described as light brown or yellowish brown, or as a lighter shade of brown. Hazel eyes have also been described as being equivalent to blue/grey. A cat's iris which is amber colored. Human amber eyes displaying the milky greenish yellow and russet/coppery tint. Amber colored eyes are of a solid color and have a strong yellowish/golden and russet/coppery tint. This might be due to the deposition of the yellow pigment called "lipochrome" in the iris (which is also found in green and violet eyes). Amber eyes are much more common in other animals than they are in humans. They are also nicknamed "cat eyes." The yellow eyes of some pigeons contain yellow fluorescing pigments known as pteridines. The bright yellow eyes of the Great Horned Owl are thought to be due to the presence of the pteridine pigment xanthopterin within certain chromatophores (called xanthophores) located in the iris stroma. In humans, yellow specks or patches are thought to be due to the pigment lipofuscin, also known as lipochrome. Green eyes are the product of moderate amounts of melanin. Green eye color has been linked to brown hair color and to peoples of Celtic, Germanic and Slavic descent. Green eyes are the rarest eye color, even in Europe. Green eyes are also found, though in slightly lower proportions, among other populations in the Middle East and South Asia, Pashtuns are often called "Hare Ankheian Vaale": those with green eyes (Urdu translation). Deities in Chinese mythology, but also in the Greek had green eyes, possibly because of their rarity, besides the colour itself. One of the most famous photographs ever published by National Geographic was a close-up of Sharbat Gula, a Pashtun girl with startling green eyes, taken in western Afghanistan by Steve McCurry in 1984. Details of her irises captured by the photograph were used to confirm her identity after she was relocated in 2002. Grey eyes are a variant of blue eyes. They are the lightest eye color and second rarest, behind green eyes. They have the least amount of melanin of any eye color. A grey iris may indicate the presence of a uveitis (caution: explicit picture). However, other visual signs make a uveitis obvious. Athena, in the Greek mythology, was renowned for having "sea-grey" eyes. Blue eyes are relatively common throughout Europe and other areas with populations of European descent, such as Canada, the United States, the Middle East, North Africa and Australia. Throughout the rest of the world they are relatively rare. Approximately 8% of the world's population has blue eyes. Blue eyes contain low amounts of melanin within the iris stroma; longer wavelengths of light tend to be absorbed by the underlying iris pigment epithelium and shorter wavelengths are reflected and undergo Rayleigh scattering. The type of melanin present is primarily eumelanin. Blue eyes are found in people of European descent. Finland and Lithuania have the highest proportions of blue-eyed people, with at least 80% in both countries. The British Isles also have high proportions, with estimates of around 70% for Ireland and about 60% for Great Britain. One survey estimated that nearly 90% of Icelanders have blue or green eyes. A 2002 study found the prevalence of blue eye color among non-Hispanic whites in the United States to be 57.4% for those born between 1899 and 1905 compared to 33.8% for those born between 1936 and 1951, apparently due to high birth rates among Catholic Italian-Americans and other brown-eyed whites in the middle of the century. Blue is the color of the indole monomer that when polymerised forms melanin. If both alleles for brown eyes (a polymerase gene) are absent or damaged, the blue color remains. The inheritance pattern followed by blue eyes is thought to be similar to that of a recessive trait. As melanin production generally increases during the first few years of life, the blue eyes of some babies may darken as they get older. The appearance of violet eyes is thought to occur due to the mixing of red and blue reflections. Some albinos have eyes that appear to be violet. Elizabeth Taylor's physical trademark is her violet eyes. ^ Wielgus AR, Sarna T. "Melanin in human irides of different color and age of donors." Pigment Cell Res. 2005 Dec;18(6):454-64. PMID 16280011. ^ a b c Prota G, Hu DN, Vincensi MR, McCormick SA, Napolitano A. "Characterization of melanins in human irides and cultured uveal melanocytes from eyes of different colors." Exp Eye Res. 1998 Sep;67(3):293-9. PMID 9778410. ^ a b Morris, PJ. "Phenotypes and Genotypes for human eye colors." Athro Limited website. Retrieved May 10, 2006. ^ Oliphant LW. "Pteridines and purines as major pigments of the avian iris." Pigment Cell Res. 1987;1(2):129-31. PMID 3507666. ^ a b c d e f g Huiqiong Wang, Stephen Lin, Xiaopei Liu, Sing Bing Kang. "Separating Reflections in Human Iris Images for Illumination Estimation." Proc. IEEE International Conference on Computer Vision, 2005. ^ a b c Sturm RA, Frudakis TN. "Eye colour: portals into pigmentation genes and ancestry." Trends Genet. 2004 Aug;20(8):327-32. PMID: 15262401. ^ a b c Grant MD, Lauderdale DS. "Cohort effects in a genetically determined trait: eye colour among US whites." Ann Hum Biol. 2002 Nov-Dec;29(6):657-66. PMID 12573082. ^ Rebbeck TR, Kanetsky PA, Walker AH, Holmes R, Halpern AC, Schuchter LM, Elder DE, Guerry D. "P gene as an inherited biomarker of human eye color." Cancer Epidemiol Biomarkers Prev. 2002 Aug;11(8):782-4. PMID 12163334. ^ a b German EJ, Hurst MA, Wood D, Gilchrist J. "A novel system for the objective classification of iris colour and its correlation with response to 1% tropicamide." Ophthalmic Physiol Opt. 1998 Mar;18(2):103-10. PMID 9692029. ^ Fan S, Dyer CR, Hubbard L. Quantification and Correction of Iris Color." Technical report 1495, University of Wisconsin-Madison, Dec, 2003. ^ Seddon JM, Sahagian CR, Glynn RJ, Sperduto RD, Gragoudas ES. "Evaluation of an iris color classification system." The Eye Disorders Case-Control Study Group. Invest Ophthalmol Vis Sci. 1990 Aug;31(8):1592-8. PMID: 2201662. ^ a b Menon IA, Basu PK, Persad S, Avaria M, Felix CC, Kalyanaraman B. "Is there any difference in the photobiological properties of melanins isolated from human blue and brown eyes?" Br J Ophthalmol. 1987 Jul;71(7):549-52. PMID 2820463. ^ a b Hammond BR Jr, Fuld K, Snodderly DM. "Iris color and macular pigment optical density." Exp Eye Res. 1996 Mar;62(3):293-7. PMID 8690039. ^ Prieto JG. "Eye color in skin cancer." Int J Dermatol. 1977 Jun;16(5):406-7. PMID 873674. ^ Eiberg H, Mohr J. "Assignment of genes coding for brown eye colour (BEY2) and brown hair colour (HCL3) on chromosome 15q." Eur J Hum Genet. 1996;4(4):237-41. PMID 8875191. ^ Frudakis T, Thomas M, Gaskin Z, Venkateswarlu K, Chandra KS, Ginjupalli S, Gunturi S, Natrajan S, Ponnuswamy VK, Ponnuswamy KN. Sequences associated with human iris pigmentation." Genetics. 2003 Dec;165(4):2071-83. PMID 14704187. ^ a b Zhu G, Evans DM, Duffy DL, Montgomery GW, Medland SE, Gillespie NA, Ewen KR, Jewell M, Liew YW, Hayward NK, Sturm RA, Trent JM, Martin NG. "A genome scan for eye color in 502 twin families: most variation is due to a QTL on chromosome 15q." 1: Twin Res. 2004 Apr;7(2):197-210. PMID 15169604. ^ Albert DM, Green WR, Zimbric ML, Lo C, Gangnon RE, Hope KL, Gleiser J. Hazel eyes often appear to shift in color from light brown to a medium or light olive green. "Iris melanocyte numbers in Asian, African American, and Caucasian irides." Trans Am Ophthalmol Soc. 2003;101:217-21; discussion 221-2. PMID 14971580. ^ a b Mitchell R, Rochtchina E, Lee A, Wang JJ, Mitchell P; Blue Mountains Eye Study. "Iris color and intraocular pressure: the Blue Mountains Eye Study." Am J Ophthalmol. 2003 Mar;135(3):384-6. PMID 12614760. ^ Lindsey JD, Jones HL, Hewitt EG, Angert M, Weinreb RN. "Induction of tyrosinase gene transcription in human iris organ cultures exposed to latanoprost." Arch Ophthalmol. 2001 Jun;119(6):853-60. PMID 11405836. ^ a b Frank RN, Puklin JE, Stock C, Canter LA. "Race, iris color, and age-related macular degeneration." Trans Am Ophthalmol Soc. 2000;98:109-15; discussion 115-7. PMID 11190014. ^ a b Regan S, Judge HE, Gragoudas ES, Egan KM. 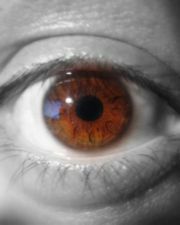 "Iris color as a prognostic factor in ocular melanoma." Arch Ophthalmol. 1999 Jun;117(6):811-4. PMID 10369595. ^ Hawkins TA, Stewart WC, McMillan TA, Gwynn DR. "Analysis of diode, argon, and Nd: YAG peripheral iridectomy in cadaver eyes." Doc Ophthalmol. 1994;87(4):367-76. PMID 7851220. ^ Naldi L, Altieri A, Imberti GL, Giordano L, Gallus S, La Vecchia C; Oncology Study Group of the Italian Group for Epidemiologic Research in Dermatology (GISED). "Cutaneous malignant melanoma in women. Phenotypic characteristics, sun exposure, and hormonal factors: a case-control study from Italy." Ann Epidemiol. 2005 Aug;15(7):545-50. PMID 16029848. ^ April Holladay. "Funny — you can't hide those lightening eyes." USATODAY.com. October 8, 2004. Retrieved September 17, 2006. ^ English JS, Swerdlow AJ, MacKie RM, O'Doherty CJ, Hunter JA, Clark J, Hole DJ. "Relation between phenotype and banal melanocytic naevi." Br Med J (Clin Res Ed). 1987 Jan 17;294(6565):152-4. PMID 3109545. ^ Hara T. "[Increased iris pigmentation after use of latanoprost in Japanese brown eyes.]" Nippon Ganka Gakkai Zasshi. 2001 May;105(5):314-21. PMID 11406947. ^ Oliphant LW. "Observations on the pigmentation of the pigeon iris." Pigment Cell Res. 1987;1(3):202-8. PMID 3508278. ^ Oliphant LW. "Crystalline pteridines in the stromal pigment cells of the iris of the great horned owl." Cell Tissue Res. 1981;217(2):387-95. PMID 7237534. ^ David Braun. "How They Found National Geographic's 'Afghan Girl'" NationalGeographic.com. March 7, 2003. Retrieved November 16, 2006. ^ Rafnsson V, Hrafnkelsson J, Tulinius H, Sigurgeirsson B, Olafsson JH. "Risk factors for malignant melanoma in an Icelandic population sample." Prev Med. 2004 Aug;39(2):247-52. PMID 15226032. ^ Imesch PD, Wallow IH, Albert DM. "The color of the human eye: a review of morphologic correlates and of some conditions that affect iridial pigmentation." Surv Ophthalmol. 1997 Feb;41 Suppl 2:S117-23. PMID 9154287. ^ Nicolas CM, Robman LD, Tikellis G, Dimitrov PN, Dowrick A, Guymer RH, McCarty CA. "Iris colour, ethnic origin and progression of age-related macular degeneration." Clin Experiment Ophthalmol. 2003 Dec;31(6):465-9. PMID 14641151. ^ Stang A, Ahrens W, Anastassiou G, Jockel KH. "Phenotypical characteristics, lifestyle, social class and uveal melanoma." Ophthalmic Epidemiol. 2003 Dec;10(5):293-302. PMID 14566630. 1 - A Cor HAZEL, que foi traduzida nos padrões como AVELÃ, é uma cor com pigmentação entre o MARROM e o AZUL, pode produzir íris multicoloridas, com o olho predominantemente MARROM próximo a pupila e mais verde ou esverdeado na borda da íris. 2 - É DIFÍCIL definir a cor HAZEL, porque as vezes ela é considerada como MARROM, e as vezes como VERDE, como foi visto acima isso depende muito da percepção de cor de cada individuo, e também do ambiente onde é analisado este olho. 3 - Talvez uma melhor descrição seria de que HAZEL seja uma cor MARROM CLARO, OU AMARELO AMARRONZADO, ou mas popularmente falando como CASTANHOS. 1 - Nos Chocolates, os olhos não devem ser propriamente severamente escuros, ou seja não devem "contrastar" com a cor da pelagem e sim "HARMONIZAR", assim cães de pelagem mais escura pedem olhos de tonalidade mais escura, da mesma forma que cães com pelagem em tom mais claro podem ter olhos mais claros. Os olhos dos chocolates devem ser de um tom avelã (Hazel) que pode ser mais claro ou um pouco mais escuro - que seria o MARROM, Jamais pretos ou qualquer cor com tonalidade que chegue próximo ao preto. Conforme explicado acima, pode em alguns casos "parecer" ligeiramente esverdeado, principalmente a luz do sol, sob "flash" de maquina fotográfica, principalmente nas bordas da íris. Concluindo: Podem sim ser mais claros do que os olhos do cães Pretos e dos Amarelos, porém VERDES propriamente dito JAMAIS, deixando claro que é muito difícil analisar isto, pois sempre tem que ser levado em conta a iluminação do local, se artificial (lâmpada incandescente ou Fluorescente), em fotos (Flash), ou sob iluminação natural, pois dependendo desses fatores, o olho pode parecer mais claro, mais escuro, mais esverdeado ou não. 2 - Nos Pretos e amarelos, Jamais devem ser NEGROS, e nem AMARELOS, sendo a cor correta o Marrom. Registrando: 99% de todos os cães fotografados acima são Campeões, Grandes Campeões, e vencedores de Rankings, julgados por arbitros de todo o mundo.